A payment gateway is a software "bridge" that requests an authorization from the card's issuing bank. When a customer has finished shopping and is ready to check out, they enter their name, address, and other information along with their credit card number, expiration, and so forth. The gateway software takes this information, sends it to the bank, and waits for a reply - either approved or declined. The first thing to do is select your payment gateway by dropping down its list and clicking on your chosen gateway. Next, fill in the required information. In the case of AuthorizeNet, you will see a block marked "AuthorizeNet Merchant ID. 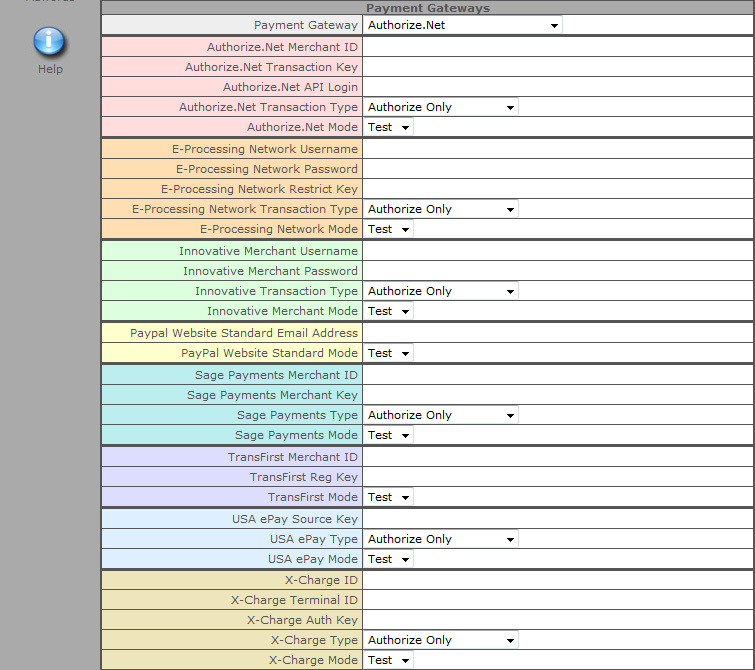 This field is only for clients using an older version of AuthorizeNet's software. Most merchants will leave this field blank. Do fill in the Transaction ID and the API Login fields. Be sure that you get the correct codes in the fields - reversing them will cause an error when you attempt a transaction. NOTE: While in test mode, the "Mode" field is locked into Test. Once you "go live" with our software, you can change this to "Live" or back to "Test" at any time.